Af fabriek is Audya4 niet van Registrations voorzien. 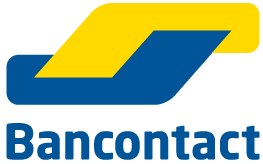 Wij weten dat het gros van onze klanten hier echter behoefte aan heeft. 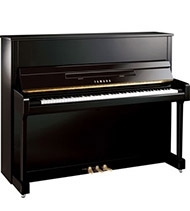 Net zoals bij bijvoorbeeld de Korg PA-serie (SongBook) of Yamaha Tyros modellen (MusicFinder) zet Muziekhuis Dera al 100 professional Single Registrations op de HD. Zowel voor de entertainer als voor de thuisspeler maakt deze extra software een snelle start met Audya4 wel heel comfortabel. PS: bij deze registraties staan ook passende styles en bij iedere registratie zit al de passende klank onder de voice groep. 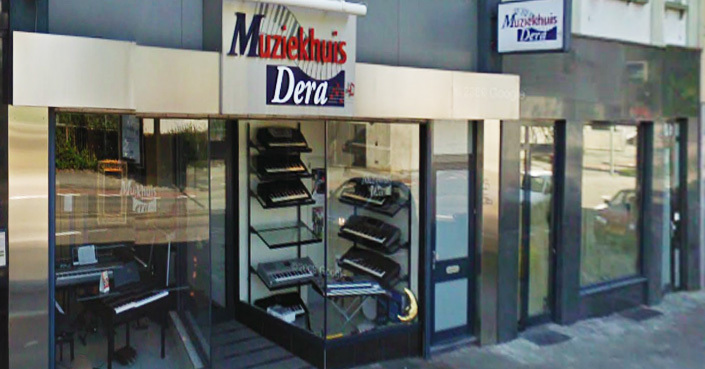 De nieuwe Ketron state-of-the-art Audya vertegenwoordigt de nieuwste generatie topkeyboards. Deze Arrnger Module is ontworpen voor zowel de entertainers als ook voor de veeleisende thuisspeler. AUDYA 4 represents a new state-of-the-art modern Expander and Arranger Module . It has a powerful audio multiplayer, a high quality sound engine and unique automatic accompaniment features. The rich set of interfaces includes a versatile video support, configurable audio connections and three USB ports to connect to computers and other multimedia devices. AUDYA 4 bring a unique and powerful Arranger Section with over 560 Styles and 370 Audio Drum sequences plus Percussions ( Live Drums ). World wide acclaimed Drummers and Percussionists get to contribute to this project to optimize the best Rhythmic and Arranger section out there today. These Audio sequences are perfectly synchronized with the Midi clock in order to allows tempo changes without sacrificing sound quality! 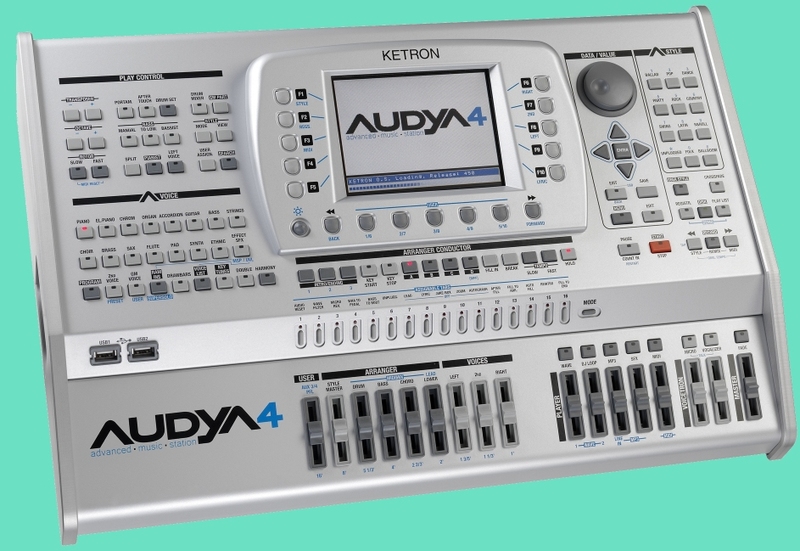 Further more, AUDYA 4 allows one to synchronize New Audio drums imported by a user (User Audio Drums ) alongside future implementations from KETRON giving a new exciting way to create their own Audio Live Drums from scratch. But that's is not all! Beside Percussion features, AUDYA 4 includes 159 Live Guitar Patterns suited for typical famous musical styles which now offers lots of authentic nuance never before available with the standard midi programming offered by other manufacturers. It's also possible load into the AUDYA 4 's Ram New Live Guitars ( GTR ) provided by KETRON and also associable with new or current styles. An innovative system called AUDIO STYLE MODELING on AUDYA 4 allows one to replace original Style parts with new ones taken from an internal huge library of : Drum Bank, Bass Bank, Grooves, Guitar BANK 1 & 2, Arp&Lick and Live Guitars. Why re-invent the wheel when KETRON has already provided you with tons of style parts which users can also use to create their own arrangements within the PATTERN section? If creativity from scratch is required, you may also use your own sequences too. New Pianist and Bassist functions bring about sophisticated control with complete harmonization and Manual Bass leads played. Backed by the experience from the flagship - Audya, KETRON raised the performance of AUDYA 4 's multiplayer to new levels of excellence. 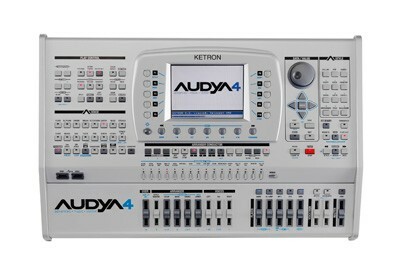 AUDYA 4 can play up to six tracks simultaneously; dual WAV, dual MP3 and dual MIDI files with DJ features such as PFL (Pre Fader Listen) - the possibility of listening to songs first within headphones before playing through the system, Playlists, Crossfades, Zoom, Song Medley and Txt synchronization to Audio and midi songs alike. With the new exciting Midi Remix feature, the user can assign and sync Midi files with a Style's Audio Drums plus … get this - all Live Guitars available!! The final result of this mix (including Midi, Audio Drums and Live Guitars), can be saved by a KETRON proprietary format called KMX ( KETRON Midi Remix ). This file can then be exported to other Audya Instruments with fully compatibility. 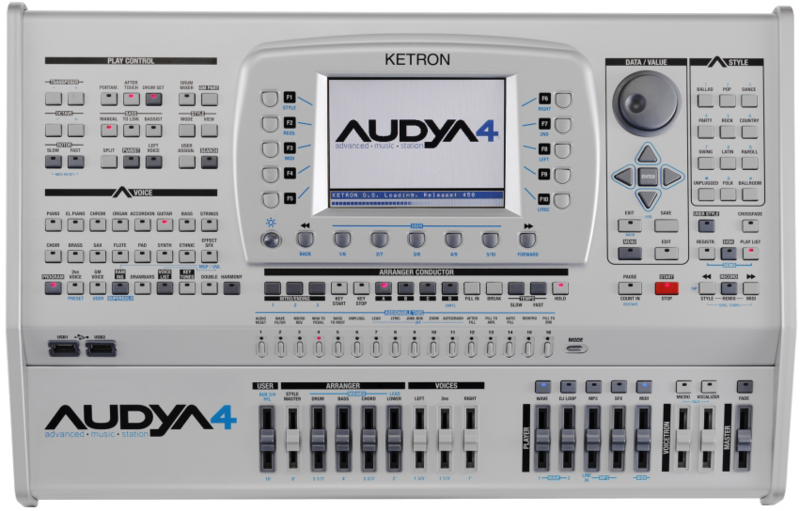 AUDYA 4 records to an internal Hard disk (80 G) any performance played as Wave, Mp3 or MRS (Macro Recording Song) format - this latest KETRON proprietary form allow one to store all instrument events performed (including voice or style changes, tempo, transpositions … etc). It's also possible import or grab any CD audiofile from external CD ROM USB device as well User could control any external audio device by Line In volume placed on AUDYA 4 layout. 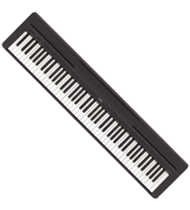 To get the best of your performance AUDYA 4 furthermore allow with KEY TUNE feature to assign your own sample on any key of external keyboard . Each sample assigned will be recalled so fast as you never can imagine . 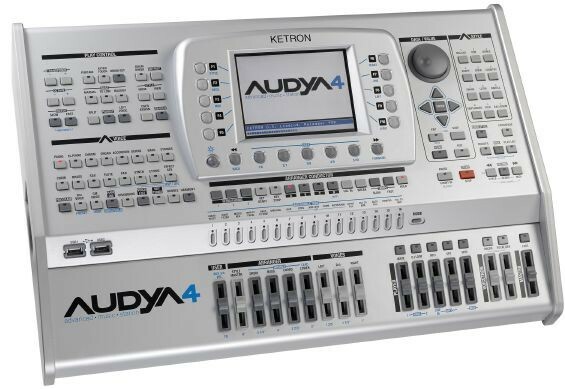 Furthermore KETRON supplied AUDYA 4 with a rich variety of DJ loops, ambience sounds and special effects, all of professional quality ready to be used out of the box. Following KETRON's tradition of the Best Natural Sounds, AUDYA 4 includes a new sound engine of very high quality. 430 new stereo Orchestral Presets with multilayer modes, 320 new Programs with one of KETRON'S latest features - "Voice Character Emulation (VCE)” VCE includes exciting special articulations plus sophisticated Performance controls such as Key Off, Morphing, Coupling, Rotor to Pedal, Aftertouch and Sustain Switch. Besides all of these new features, a user can store within a Voice their own Harmony mode in order to achieve the best setting (OTM - One Touch Melody). A Preset Selection can be modified and saved as new Program by using the Edit menu available in AUDYA 4. The user can also carefully adjust their timbre, dynamic, effects and over all the new articulation features as well. 16 Voice List with 300 Programmable Sounds plus the new UVL feature ( User Voice List ) allows one to automatically recall a Voice list which can also include a Style, Midi file, Mp3 or Wav file. In addition to the built in 64 MBs of RAM for more personalised sounds that can quickly be loaded from disk, we listened to our users' request for more memory and now, one can also upgrade this memory with a new expansion up to 256 MB to add to the internal wavetable a complete new Sound Bank. AUDYA 4 also has a renewed DSP section, with new Rotor, Distortion, Phaser, Flanger, Tremolo, Chorus, Reverb effects and much more. With the newest SAMPLER Section, the user can now sample their own sounds and manage in great detail - thanks the ultimate multisample editor, MSP. AUDYA 4 has a new Vocalizer which incorporates five voices that performs with the best standards on the market today. The Vocalizer is easy to use thanks to the extended preset library, but it can also be edited by the musician with controls over the harmonic content of the voice, equalization and effects. The Vocalizer works in real time on one of the two microphone inputs of AUDYA 4. It has dedicated reverb and delay functions and can be controlled manually with the module or automatically, via the Arranger or MIDI files. An innovative linking method of the chords means that Voicetron is able to interpret musical passages according to the rules of traditional harmony. AUDYA 4 allow to manage aftertouch and portamento feature. The control panel is designed to help the musician, especially in live situations. Seventeen sliders, (one assignable), offer an efficient control of volumes and effects in real time. 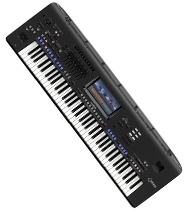 The instrument's current status is clearly shown by the various LEDs built into the keys and by the graphics that appear on the integrated colour display (LCD TFT technology with a resolution of 320x240). The user interface is similar to that of modern computers, so it is pretty easy to use. In addition to the 10 User tabs currently on the panel and the traditional Pedal foot controls (Footswitch ), AUDYA 4 includes a new section of assignable Tabs 1-16. 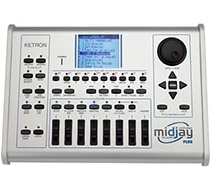 These buttons come with a default KETRON factory setting plus a free programmable user section (User Tabs), which allows direct management over other more important AUDYA 4 features. A new revolutionary Registration structure means that you can save and instantly recall not only the general status of the instrument (Sounds, Styles, Volumes, Micro etc.) but also any links to an audio source required for the performance, for example a Wave, an Mp3, a Midi file and even a Playlist. 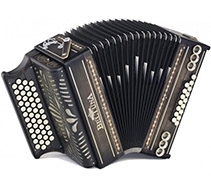 There is also a Language menu for the customised viewing of the most important functions of the instrument in several languages. Via its video port, AUDYA 4 can display colour images with lyrics synchronised with the music onto a larger TV screen (PAL or NTSC) or on a VGA monitor. As an alternative, it can show an exact copy of the LCD display (Mirror). AUDYA 4 offers an absolutely complete set of inputs and outputs, both analogue and digital. Together with the typical pair of stereo audio outputs, there are four separate outputs that can be configured as auxiliary stereo audio outputs or as mono audio outputs (with or without DSP effects). AUDYA 4 also has two stereo input lines, an output for headphones, 4 Midi ports, two Combo inputs ( XLR + 1/4" ) for the microphone and a dedicated output for the metronome click (for recording or use with a live drummer … etc). AUDYA 4 and it's internal Hard Disk can easily be connected via USB to a computer to edit the musical contents of the instrument and to back-up files. Furthermore, two USB host ports accept many mass storage devices, such as the very popular USB sticks, external USB hard drives, CD and DVD readers, to be able to exchange data externally with absolute ease. Module Professional Arranger and Midi Sound module. 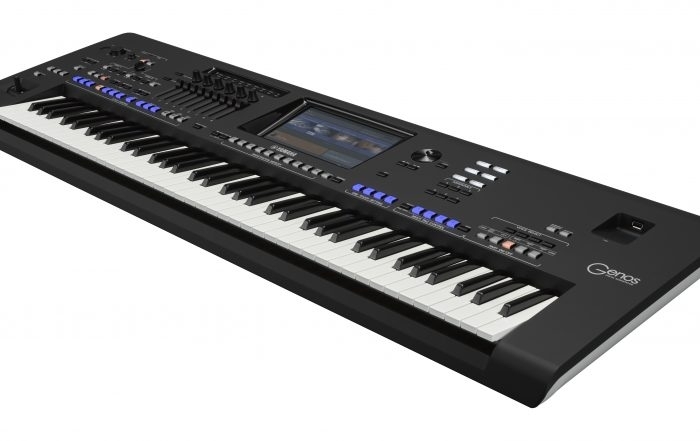 8 dynamic curves, Aftertouch, Portamento, Operating system updatable via USB port, 17 Volume slider controls (1 assignable), 10 display User Tab. Display 320 x 240 pixel TFT colour graphic display. Hard Disk 80 GB ATA 2,5”. USB: 2 USB Host + 1 USB device. Mass storage devices supported: USB sticks, USB floppy disks, MP3 players, CD-ROM and DVD ROM, HD. Sound Generation 430 New Presets with Stereo and multi-layer Voices, 512 GM2 sounds, 32 parts Multitimbral, Voice Character Emulation (VCE), Left Voices, 2nd Voice. Voice List Up to 300 custom sound locations + 20 User Voice List (UVL) linkable with Style, Midi file, Mp3 and Wave. Organ Drawbars 9 Digital Drawbars, Rotor, Click, Percussion, Overdrive. Ram/Ins 64 MB RAM (Expandable up to 256 MB). Ins Orchestral Voices, Supersolo. Assignable Switch Tabs 1-16 Factory /User programmable Features, 5 Modes. Sampler 44,1KHz, Multi sampler editor ( MSP). 2 x Wav, 2 x Mp3, 2 x Midi, Real time stretching and Audio transposition, DjLoop, Sfx, Demos, Play list, Autoplay, Key Tunes, HD Recording 2 tracks, Pfl, MP3 Encoder, Audio Ripper, Macro Recording. Midifile Player SMF player Mid / KAR and TXT file, Jukebox, Song Chain, Audio Drum and Live Guitar, Remix, Midi Song Record, Wave Sync, Medley, MidiMix. Registrations Global panel settings, Single and Block Mode. Drum 1 51 Drum sets, 3 Super Kit, 24 User Drum sets, 10 Percussion sections, Drum mixer, Manual Drums. Drum 2 (Groove) : 62 Live Drums Loops. Real Audio Arranger 570 styles, User Audio Drum, over 370 Real Audio Drums Sequences, Acoustic and Electric Live Guitar, User Live Guitar, Arranger ABCD, 3 Intro/ending, 4 Fill ins, 4 Breaks, Bassist and Pianist, Audio Style Modeling. Module Control Octave /Double, Harmony, Transposer, Arabic Scale. 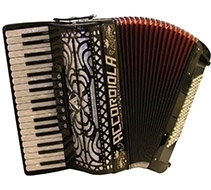 Accordion International and Belgian systems. Dsp Effects 3 multi-effect DSPs, Reverb, Chorus, Flanger, Delay, Phaser, Tremolo, Tap Delay 4/8, Wha-Wha, Distortion, Overdrive, Slow/Fast Rotor, Parametric 4-band Equalizer. Microphone 1&2 2 Microphone inputs Gain control,10-band Equalizer, Echo, Reverb, Pan, Pitch Shift, Talk, Voice Transform. Voicetron 5 Voices Harmonizer, Vocoder mode, Autoharmony, MIDI Vocalizer track, Advanced editing. Midi In 1, In2 , Out, Thru. 32 Midi Channels. GM2 standard. Outputs Left/Mono, Right, 4 individual assignable outputs (2 stereo or 4 mono), Stereo headphone. 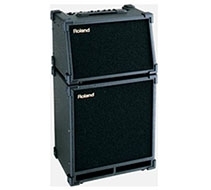 Inputs: 2 XLR microphone inputs, 2 line in inputs (stereo), Sustain and Pedal Volume, Footswitch (6 or 13 switches). Video Interface: Systems PAL, NTSC, Super VHS, VGA monitor Resolution: 640 x 480. Accessories User manual, Power Cord. 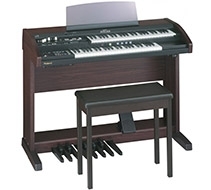 Optionals Hard Case, Sustain Pedal, Volume Pedal, Footswitch FS6/FS13, Midi Pedalboard, Ram kit up to 256 MB. Dimensions: L x W x H = 21” x 13” x 5” - (52 cm x 32 cm x 11 cm). Power: Automatic Voltage detection - 110V/60Hz – 240V/50Hz .